so i picked up a eurorack case today off gumtree today to put the dfam and neutron in. I took advantage of an ebay discount voucher to ordered a maths & pamela's new workout as well. I'll post pics and some sounds from it when I get it all set up. So I have fallen for it. I've spent hours watching videos of classic old synth filters made in eurorack and starting a list of what to potentially try next. Has anyone else taken the plunge? Had experience with it? I'd be happy to know how you've got on with it or just any great modules I should consider trying? I think your only hope is to beg to be let into a monestary, where you’ll read the bible all day, and get 3 rounds of cheese and bread. Otherwise it’s financial hell for you! given the amount of pedals and guitars that have flowed through my hands I hope to have the same discipline to rotate here. The purchases I am making now is because I sold off a load of other musical items and I have a garage full of stuff to get rid off that I'm not using anymore. I also plan a few diy projects as well. Pics once it all arrives and is set up. 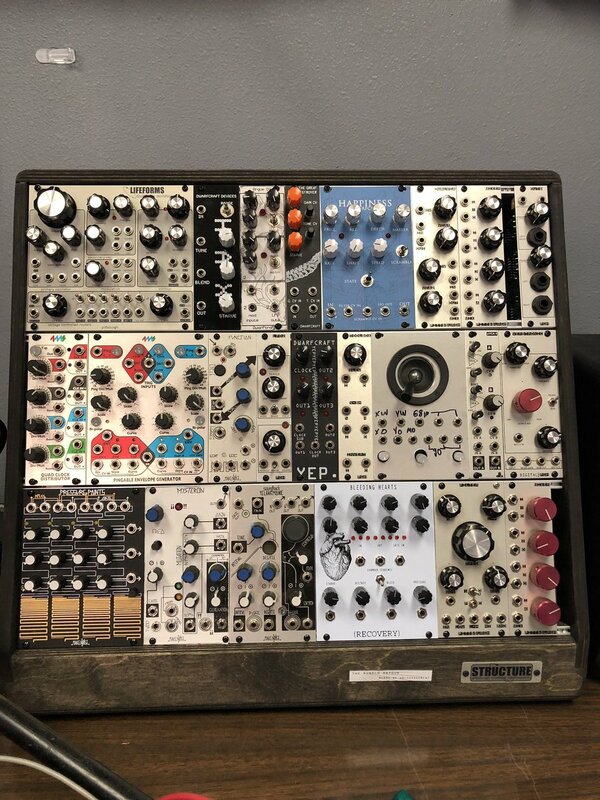 Here is My modular grid rack here if you are interested. Whaoh, there's whole websites for mapping out your rig? I must admit, I don't really understand modular or euro rack. Is it just elements of synthesis, like filters, etc, and you run another signal through them? What now? Eurorack Stinky Sizers? Yes you could say I am familiar. good call on the MATHs. The way I use the modular is all centered around modulating really flexible envelopes, and "weird" oscillators, historically the Makenoise Telharmonic, although now I have that big old pittsburgh Double Helix, too. So most of the rack here is for R&D of the dwarfcraft Modules, so there's a lot of those up there. The joystick is a (mostly) working thing but the parts are too rare to put into production. But OK, the whole rundown? Pittsburgh Double Helix, Dwarfcraft HAX, Dwarfcraft Argue D2 (prototype) Dwarfcraft The Great Destroyer, Dwarfcraft Happiness (prototype) PIttsburgh VCA, Mixer, Outs. Nice mix and with your prototypes how many are you looking at releasing? That looks brilliant but I do want to stomp all on it. Looking at releasing the Argue D2 (Dual LFO) and Happiness (filter/lfo) The YEP and HAX are pretty much discontinued already haha. Why did you discontinue them? I was actually talking to our local modular shop about your pedals last week. He said a few of their customers who are doing noise stuff were using them. so that's like, 2 grand's worth already? this is why i can't get involved. Ive been hunting a lot of 2nd hand, eBay vouchers for money off or like the dfam a shop demo model. I’d probably of spent similar on a couple of synths and drum machines and all has been funded from gear sales (synths and guitars). I know what you mean, I’m definitely letting this settle in and learn about what I’ve now got but it feels great being able to create stuff that I couldn’t imagine and letting my fixation of just riffing and letting the different ways of being able to modulate things let the sounds evolve. a little bit of noodling on the dfam, hats909 and a bit of modulation trying to automate some movement. thanks, I've been recording more and will get some clips posted to soundcloud. The Neutron is proving to be great with all its patchpoints, hidden modulation and other features. Its a great compliment to the other modules and the dfam.